Thanks to FaceMOUSE Machine even severly disabled people can now use the computer in full authonomy, thus being able to write, move the mouse cursor, surf the web, access multiple softwares, play video games, and the like, as it is shown in the video. <style=”text-align: center;”>With no need for hands, voice or switches, but with just easy movements in front of a webcam. FaceMOUSE Machine is a mouse assistive device designed for disabled people with the capability of adapting itself to the person, much in the same way water takes the shape of its container. 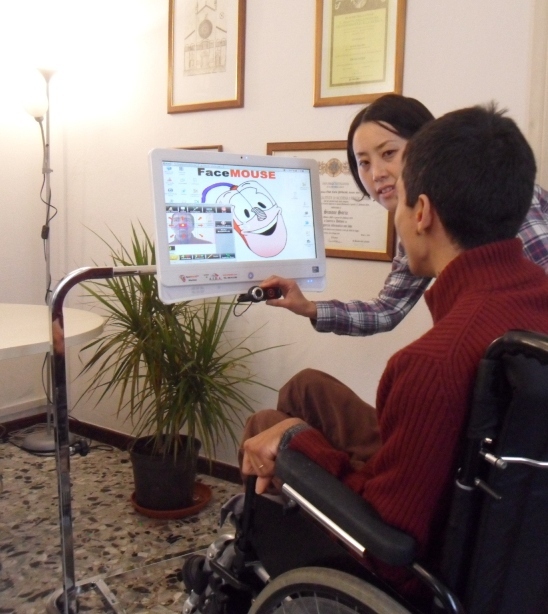 In particular, FaceMOUSE is an assistive device for cerebral palsy, but also it is effective with muscular dystrophy, amyotrophic lateral sclerosis and other pathologies.